Monobloc cylinder casting of the Low four-cylinder, the five bearing four-throw crankshaft and one piston. The bore and stroke, are 52 x 58 mm. Kick-starter mechanism and dynamo drive. The small independent wheel beneath the main shaft is for splashing the oil into the gear box. 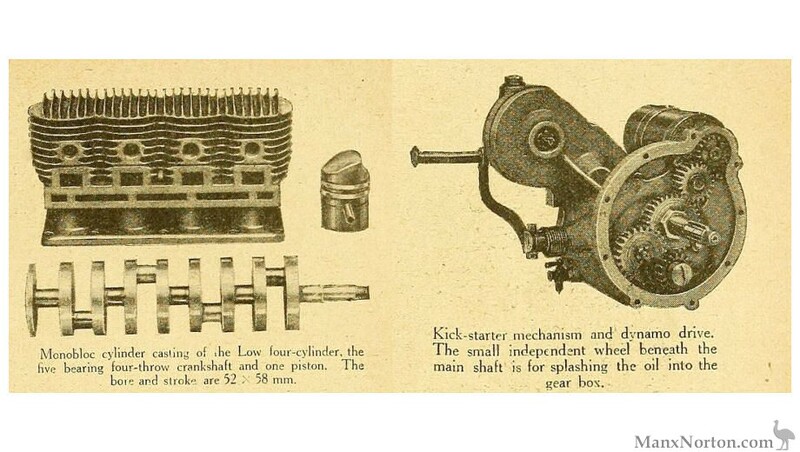 The engine was a 492 cc air-cooled four-cylinder two-stroke, used for the first time on a motorcycle.